This is our third quarterly update of the “Trump’s Numbers” scorecard that we posted in January and updated for the first time on April 16 and again on July 11. We’ll publish additional updates every three months, as fresh statistics become available. As always, starting when we posted our first “Obama’s Numbers” article six years ago — and in the quarterly updates and final summary that followed — we’ve included statistics that may seem good or bad or just neutral, depending on the reader’s point of view. This update includes the first comprehensive looks at crime, income and poverty during the president’s first year in office. The FBI’s report of crime rates for all of 2017 was released Sept. 24, and the Census Bureau’s figures for median annual household income and poverty levels during 2017 were released Sept 12. Other statistics are released quarterly, monthly and sometimes daily, and we include here the most recent available as of this date. Employment — Total nonfarm employment grew by 3.8 million during the president’s first 20 months in office, according to the most recent figures available from the Bureau of Labor Statistics. That continued an unbroken chain of monthly gains in total employment that started nearly eight years earlier, in October 2010. The average monthly gain under Trump is 190,000 jobs, which is 12 percent below the average monthly gain of 217,000 during Obama’s second term. Unemployment — One reason for the slowdown in job growth: fewer job-seekers. The unemployment rate — which was well below the historical norm when Trump took office — has continued to fall a full 1.1 percentage point lower. The rate was 4.8 percent when he was sworn in, and fell to 3.7 percent in September. The last time it was that low was October of 1969 — nearly 49 years earlier. The historical norm is 5.6 percent, which is the median monthly rate for all the months since the start of 1948. The lowest unemployment rate ever recorded was in 1953, when the rate was 2.5 percent for a couple of months. Job Openings — Another reason employment growth has slowed is a worsening shortage of qualified workers. The number of unfilled job openings hit a new record of more than 6.9 million as of the last business day in July — the most in the 18 years the Bureau of Labor Statistics has been tracking them. That’s a gain of nearly 1.5 million unfilled job openings — or 27.5 percent — since Trump took office. Labor Force Participation — Despite the abundance of jobs, the labor force participation rate — which went down 2.8 percentage points during the Obama years — has slipped a bit more under Trump. Republicans often criticized Obama for the decline during his time, even though it was due mostly to the post-World War II baby boomers reaching retirement age, and other demographic factors beyond the control of any president. The rate is the portion of the entire civilian population age 16 and older that is either employed or currently looking for work in the last four weeks. Since Trump took office, the rate has fluctuated in a narrow range between 63.0 percent and 62.7 percent. It was 62.7 percent in August, 0.2 percentage points below where it was the month Trump took office. The number rose by 378,000 between Trump’s inauguration and September. 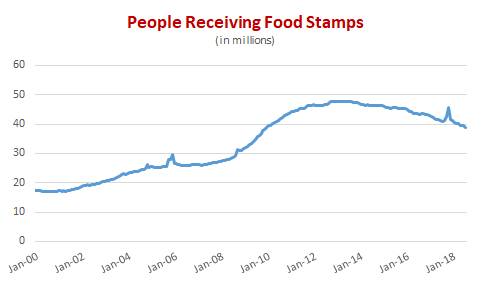 That followed a net decrease of 192,000 under Obama. The increase under Trump amounts to 3.1 percent, compared with the 2.6 percent increase in overall employment. The number of manufacturing jobs is still nearly 1 million below where it was in December 2007, at the start of the Great Recession. The economy is growing faster under Trump — spurting to a yearly rate of 4.2 percent in the second quarter of 2018, the most recent official estimate available. That’s up from the 2.2 percent increase during his first year, followed by a 2.2 percent yearly rate in the first quarter of 2018, according to the most recent estimate of the Bureau of Economic Analysis. That’s the “real” rate of growth in gross domestic product after accounting for price inflation. The 4.2 percent rate is just within the 4 percent to 6 percent rate Trump promised repeatedly, both when he was a candidate and also as president. The “GDP Now” forecast produced by the Federal Reserve Board of Atlanta projects that the third-quarter growth rate continued at a 4.2 percent annual rate. The official estimate for the third quarter of 2018 won’t be released until Oct. 26. Most economists believe the current growth spurt is temporary. 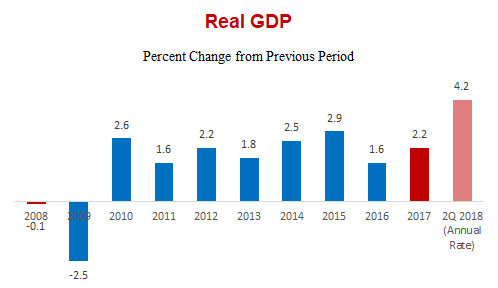 The nonpartisan Congressional Budget Office issued an updated economic forecast Aug. 13 projecting real GDP to grow 3.1 percent this year, and 2.4 percent in 2019. That’s in line with the most recent median forecast of the Federal Reserve Board members and Federal Reserve Bank presidents (issued Sept. 26), which is for 3.1 percent growth in 2018, 2.5 percent in 2019 and 2.0 percent in 2020. Other leading economists tend to agree. Of the business and university economists who offered an annual GDP forecast to the Wall Street Journal‘s monthly economic survey in October, the average prediction was for 3.1 percent growth this year and 2.4 percent next year. Similarly, the National Association of Business Economists’ October survey produced a median forecast of 3.1 percent growth this year and 2.5 percent next year. Technical Note: Historical GDP figures given here are slightly different from those given in earlier “Numbers” articles, because on July 27 the Bureau of Economic Analysis issued its 15th “comprehensive update” of GDP figures, something it does roughly every five years in an effort to improve the quality of its economic measurement. In this case, some figures were revised slightly all the way back to 1929. The new BEA estimate of GDP growth for the 10 years ending last year has increased by an average of 0.1 percent. Household Income — Household income hit another record during Trump’s first year — but it’s a record with an asterisk. In percentage terms, the increase in 2017 was 1.8 percent, following a 3.1 percent increase in 2016. However, a senior Census official cautioned that the latest “records” in 2016 and 2017 are due in part to a change in the survey questions in 2014. Starting then, the annual survey has picked up some sources of income that were previously missed. Taking this into account, Jonathan L. Rothbaum, chief of the Income Statistics Branch, said the 2017 median income would be in a “statistical tie” with incomes measured in 2007 and 1999. Poverty — As incomes rose, the rate of poverty declined. The percentage of Americans living with income below the official poverty line went down to 12.3 percent of the population in 2017, the lowest level since 2006, just before the Great Recession of 2007-2009. The poverty rate has now declined for three consecutive years, dropping by 1.3 percentage points in 2015, by 0.8 points in 2016 and by 0.4 points in Trump’s first year. The growth of federal regulation didn’t come to the “sudden, screeching and beautiful halt” Trump once claimed, but it does seem to have ground slowly to a stop over many months — and in recent months has reversed. But since that April peak, the number has declined by a little over one-quarter of 1 percent as of Oct. 10. That decline has grown a bit larger since our last report, suggesting that it may be the start of a trend, and not just a temporary blip. Overall, the drop still leaves a nearly 0.5 percent net increase in restrictive words and phrases in the nearly 20 months since Trump took office — a far slower rate of rise than in the past. The average annual growth during both the Obama years and the George W. Bush years was just under 1.5 percent, according to annual QuantGov tracking. The Mercatus Center database provides a hard count of specific legal mandates and prohibitions imposed by federal regulators that we find to be more relevant than counts of the number of pages or words in the rulebook. It doesn’t attempt to assess the cost or benefit of any particular rule — such assessments require a degree of guesswork and are sensitive to assumptions. But it does track the sheer volume of federal rules with more precision than we have found in other metrics. Some of the rules Trump has eliminated are quite significant. Within a month of taking office, for example, Trump signed a law nullifying an Obama-era rule prohibiting coal mining companies from dumping waste into streams and waterways. And on April 13 his administration withdrew Obama’s edict requiring automakers to double the fuel efficiency of new autos and light trucks to 50 miles per gallon by the year 2025. Instead, the requirement will be capped at 37 mpg starting in 2020. Crime declined a bit in Trump’s first year, except for rapes, assaults and motor vehicle thefts, which increased. The number of homicides declined by 0.7 percent in 2017, according to the FBI’s annual Crime in the United States report, after rising for the previous two years. The number of all violent crimes went down by 0.2 percent. That included a 2.5 percent increase in rapes and a 1 percent increase in assaults, offset by a 4 percent decrease in robberies and the drop in homicides. The number of property crimes went down 3 percent in 2017, including a 7.6 percent drop in burglaries and a 2.2 percent decrease in larcenies (such as shoplifting), but the number of motor vehicle thefts increased slightly, by 0.8 percent. And early data suggests that crime rates are declining further this year. The Brennan Center for Justice at the New York University School of Law projects that the murder rate in the 30 largest U.S. cities will go down another 7.6 percent this year, based on preliminary data from 29 of those cities. As a candidate, Trump repeatedly claimed that the murder rate was “the highest it’s been in 45 years.” That was wildly untrue. In fact, the murder rate had dropped to the lowest on record in 2014 — 4.4 murders per 100,000 inhabitants. And while it did rise for the next two years, it was still only 5.4 per 100,000 in 2016, just where it had been the year before Obama took office, and far below the peak rate of 10.2 reached in 1980. In Trump’s first year, the murder rate dropped down a notch to 5.3 per 100,000 population — still higher than in each of the first seven years under Obama. A total of 35,700 coal mining jobs disappeared during the Obama years, but as of September, only 1,900 of them had come back under Trump, according to BLS figures. That’s 5.3 percent of the coal mining jobs lost during the Obama years. Revised figures from the Energy Information Administration show CO2 emissions at first fell by 0.8 percent in 2017, less than the 1.6 percent decline in Obama’s final year. They fell by a total of 14.3 percent between 2007 and 2017, due mainly to electric utilities shifting away from coal-fired plants in favor of cheaper, cleaner natural gas, as well as solar and wind power. But that downward trend that slowed sharply in Trump’s first year has now reversed entirely. Emissions during the most recent 12 months on record, ending in June 2018, were 0.8 percent higher than in all of 2016. And the rise is expected to continue. EIA predicted in October that CO2 emissions will increase by 2.2 percent for all of 2018, compared with 2017. “This increase largely reflects higher natural gas consumption because of a colder winter and a warmer summer than in 2017,” EIA said. These projections are sensitive to changes in weather, economic growth and energy prices — all difficult to forecast. Illegal border crossings declined under Trump, dropping sharply at first but lately rising again to nearly where they were the year before he took office. The number of people caught while illegally trying to cross the U.S. border with Mexico each month plunged to a low of 11,127 in April of last year, according to figures released by U.S. Customs and Border Protection. But since then, the number has more than tripled, hitting 37,544 in August, the most recent month on record. So far in 2018, the monthly average is 33,942, which is just 8 percent below the monthly average of 36,912 in 2016. After-tax corporate profits are running at a record level under Trump. During the second quarter of 2018, they hit an annual rate of $1.96 trillion, the best quarter ever recorded. The current rate is 13 percent higher than the full year figure for 2016. In our July update, we reported that full-year profits also set a record in 2017, but that’s no longer the case. After we posted that update, BEA on July 27 revised its GDP figures (of which corporate profits are one element) going back to 1929. As currently estimated, the $1.83 trillion in profits in 2017 was an increase of 5.4 percent over 2016, but still just shy of the $1.86 trillion now recorded for 2014 — the current full-year record. Stock prices continued their long rise under Trump, setting record after record — only to see much of the gain erased in a huge two-day sell-off just before we posted this article. Despite the recent market tumble, at the close on Oct. 11 the Standard & Poor’s 500-stock average was 20.5 percent higher than it was on the last trading day before Trump’s inauguration, and only 6.7 percent below the most recent record high set on Oct. 3. Other indexes rose even more. The Dow Jones Industrial Average, made up of 30 large corporations, was up nearly 27 percent under Trump. And the NASDAQ Composite index, made up of more than 3,000 companies, was 32 percent higher than before Trump took office. The bull market that began in 2009, at the depths of the Great Recession, passed its ninth anniversary in March and on Aug. 22 was widely proclaimed to be the longest-running bull market in modern financial history. By this common measure (with which some quibble), it would require a 20 percent drop from the Oct. 3 high to end the historic bull run and qualify as a new bear market. CPI — The Consumer Price Index rose 3.3 percent during Trump’s first 20 months (through September of this year), continuing a long period of historically low inflation. In the most recent 12-month period, the CPI rose 2.3 percent. The CPI rose an average of 1.8 percent each year of the Obama presidency (measured as the 12-month change ending each January), and an average of 2.4 percent during each of George W. Bush’s years. Wages — Wage increases continued to outpace inflation, and so the purchasing power of weekly paychecks rose. The average weekly earnings of all private-sector workers, in “real” (inflation-adjusted) terms, rose 1.8 percent during Trump’s first 20 months, after going up 4.0 percent during Obama’s eight years. For rank-and-file production and nonsupervisory workers (who make up 82 percent of all private-sector workers), real weekly earnings have gone up 1.6 percent so far under Trump, after rising 3.7 percent during Obama’s eight years. Consumer confidence in the economy soared after Trump’s election, to the highest it has been in over a decade. The Michigan survey’s confidence figure has remained high, and most recently was 100.1 in September, topping 100 for yet a third time since 2004. The highest point between Obama’s inauguration and Trump’s election was 98.1 in January 2015. The most recent sales figures from the National Association of Realtors show the national median price of an existing, single-family home sold in August was $267,300. Earlier, in June, the average price hit $276,500 — the highest ever recorded — but prices fell back a bit in July and August. . The August average is still $38,600 higher than the median price of $228,700 for homes sold during the month Trump took office — a gain in value of 16.9 percent. The rise in the Consumer Price Index during the same period was 3.2 percent. The Case-Shiller index for July sales also was a record high, and was 11.1 percent higher than where it stood in the month Trump took office. Homeownership — Meanwhile, the percentage of Americans who own their homes has continued to recover from a years-long slide, gaining 0.6 percentage points since Trump took office. The homeownership rate began to slide in 2004 after peaking at 69.2 percent of households for two quarters. It hit bottom in the second quarter of 2016 at 62.9 percent — the lowest point in more than half a century, and tied for the lowest on record. The rate recovered 0.8 points before Trump took office, and has gone up another 0.6 points since then, reaching 64.3 percent in the second quarter of 2018, according to the most recent Census Bureau figures. The most recent government figures show that the total U.S. trade deficit in goods and services during the most recent 12 months on record, ending in August, was $583 billion. That’s 16.2 percent larger than in 2016. That increase came despite a 6.6 percent one-month drop in May, to the lowest monthly deficit since October 2016, before Trump was elected. But this drop proved to be temporary, as it was driven by a surge in exports led by soybeans and commercial aircraft. Exporters rushed to beat the punitive tariffs (import taxes) that China had promised to impose (and later did) in retaliation for Trump’s proposed taxes on what the U.S. buys from China. Trump has initiated a full-scale trade conflict with China, threatening to impose taxes on practically everything the U.S. imports from China. The first tariffs took effect at 12:01 a.m. on July 6, prompting China to retaliate with increased tariffs on $34 billion in U.S. goods. There is as yet no negotiated solution in sight. But on Oct. 11, news reports said Trump and China’s leader, Xi Jinping, had agreed to meet personally in November to discuss a way forward. Mexico — Meanwhile, the much smaller trade deficit in goods and services with Mexico totaled nearly $70 billion during the 12 months ending in June, an increase of 11.9 percent compared with 2016. Canada — The trade surplus that the U.S. runs with Canada grew just a bit smaller under Trump. The trade balance was positive by $6.5 billion during the 12 months ending in June — meaning that the U.S. sold that much more in goods and services to Canada than it bought from that country. That surplus is 11.8 percent smaller than it was in 2016. On Aug. 27 the president announced he had reached a tentative new trade agreement with Mexico, and on Oct. 1, he announced that Canada had joined. Renegotiating the 24-year-old North American Free Trade Agreement had been a key campaign promise. The new agreement will be called the United States-Mexico-Canada Agreement, or USMCA. It is expected to be signed by leaders of the three countries within 60 days, but requires approval by Congress before it can take effect. The number of people lacking health insurance has barely changed under Trump, but millions are expected to drop or lose coverage next year and in subsequent years. The most recent report from the National Health Interview Survey estimates that 28.3 million people were uninsured during the first three months of 2018, about 300,000 fewer than in 2016. Only 8.8 percent of the population lacked health coverage during that time, down from 9.0 percent during Obama’s last year. That’s a reversal of the trend in Trump’s first year, when the number who lacked coverage rose by 700,000, according to the NHIC, and by 491,000, according to recently released Census figures. Both NHIC and Census said the increase measured in 2017 was not statistically significant. Census and NHIC use slightly different definitions and methods to measure the uninsured. We feature the NHIC figures because they are released every three months, and are thus more timely than the annual Census tally. Trump failed to “repeal and replace” the Affordable Care Act as he promised to do. But in December, he signed a tax bill that will end Obamacare’s tax penalty for people who fail to obtain coverage. At that point, Trump told reporters that “Obamacare is finished. It’s dead. It’s gone.” But that’s not so; the mandate penalty remains in effect until 2019, and the sale of subsidized insurance on Healthcare.gov and state exchanges remains indefinitely. So the big impact is expected later. According to an estimate by the nonpartisan Congressional Budget Office, the end of the mandate penalty next year will cause 4 million people to lose or drop coverage in 2019, rising to 12 million two years later and 13 million in 2025. As of July, the most recent month for which figures are available, 38.9 million people were receiving the aid, the lowest number since November 2009. The number has gone down nearly 3.8 million, or 8.8 percent, since January 2017, when Trump took office. Supreme Court — So far Trump has won Senate confirmation for two Supreme Court nominees, Justice Neil Gorsuch and, on Oct. 6, Brett M. Kavanaugh. Obama also was able to fill two high court vacancies during his first two years in office, with Justice Sonia Sotomayor and Elena Kagan. But the Kavanaugh nomination to fill the vacancy created by Justice Anthony Kennedy’s retirement is significant because Justice Kavanaugh may move the court to the right. He is considered more conservative than Kennedy, who sometimes sided with the liberal justices to provide deciding votes on issues including gay rights, abortion, capital punishment and affirmative action. Court of Appeals — Trump also has won confirmation for 26 U.S. Court of Appeals judges. That total compares with only 11 for Obama at the same point in his first term. District Court — Trump also has won confirmation for 41 of his nominees to be federal District Court judges, exceeding the 30 for whom Obama had won confirmation at the same point in his presidency. Even before Kavanaugh’s confirmation, USA Today called this early success in winning judicial confirmations “perhaps Trump’s most significant achievement” to date. However, responsibility must be shared with the Republican leadership of the Senate, which not only refused to consider Obama’s appointment of Merrick Garland to fill the Supreme Court vacancy eventually filled by Trump’s appointee Gorsuch, but also blocked confirmation of dozens of Obama’s nominees to lower courts. Trump inherited 17 Court of Appeals vacancies, for example, including seven that had Obama nominees pending and that expired at the time Trump took office. The federal debt held by the public stood at nearly $15.8 trillion at the last count on Oct. 10 — nearly $1.4 trillion higher than when he took office. That’s a 9.4 percent increase under Trump. And that figure will go up even more quickly in coming years unless Trump and Congress impose massive spending cuts, or reverse course and increase taxes. The annual federal deficit for fiscal year 2017 (which was largely the result of spending and taxes set under Obama) was nearly $666 billion, up from just under $586 billion the year before. And now Trump’s cuts in corporate and individual income tax rates — as well as the bipartisan spending deal he signed Feb. 9 — are causing the red ink to gush even faster than it did before. The nonpartisan Congressional Budget Office expects the deficit for fiscal year 2018, which ended Sept. 30, will be around $782 billion when the Treasury Department completes its final tabulation. That’s an increase of $116 billion from the previous fiscal year. Corporate income tax receipts alone fell by $92 billion, CBO estimated. CBO now estimates that the deficit will continue rising for the foreseeable future, exceeding $1 trillion annually starting in FY2020. (Baseline deficit projections are in Table 1, page 2.) Further, CBO said on June 29 that under current law, federal deficits will continue growing for the next 30 years, “reaching the highest level of debt relative to GDP in the nation’s history by far.” CBO projected that under current law, debt would reach 152 percent of the nation’s total annual economic output by 2048 — up from 78 percent currently. U.S. crude oil production resumed its upward trend under Trump, rising 14.7 percent during the most recent 12 months on record (ending in July), compared with all of 2016. As a result, the trend to reduce reliance on foreign oil also resumed. The U.S. imported only 15 percent of its oil and petroleum products during the first eight months of 2018, down from 24.4 percent in all of 2016. The U.S. image abroad continues to suffer under Trump. Polling this year in 25 countries by the Pew Research Center shows those saying they have a favorable view of the United States is down in country after country, compared with the end of the Obama presidency. To the north, only 39 percent of Canadians view the U.S. favorably, down 26 percentage points. Among NATO allies, the U.S. favorability rating dropped 27 points among Germans, to 30 percent. It is down 25 points among the French, to 38 percent, is down 31 percent among the Dutch, to 34 percent, and is down 11 points among the British, only half of whom now view the U.S. favorably. Sixty-seven percent of Japanese still view the U.S. favorably, but even that figure is down 5 points from where it was under Obama. And 83 percent of Israelis still view the U.S. favorably, up 2 points from the end of Obama’s time. The only big improvement was among Russians, but even that gain is fading. Last year, Pew’s polling found 41 percent of Russians viewed the U.S. favorably, an increase of 26 points in Trump’s first year. But a year later, Pew’s polling now shows only 26 percent of Russians view the U.S. favorably — the lowest of all 25 countries surveyed — a gain of only 11 points. Bureau of Labor Statistics. “Employment, Hours, and Earnings from the Current Employment Statistics survey (National); Total Nonfarm Employment, Seasonally Adjusted.” Data extracted 11 Oct 2018. Bureau of Labor Statistics. “Labor Force Statistics from the Current Population Survey; Unemployment Rate, Seasonally Adjusted.” Data extracted 11 Oct 2018. Bureau of Labor Statistics. “Job Openings and Labor Turnover Survey: Job Openings, Seasonally Adjusted.” Data extracted 11 Oct 2018. Bureau of Labor Statistics. “Labor Force Statistics from the Current Population Survey; Labor Force Participation Rate.” Data extracted 11 Oct 2018. Bureau of Labor Statistics. “Labor Force Statistics from the Current Population Survey; All employees, thousands, manufacturing, seasonally adjusted.” Data extracted 11 Oct 2018. U.S. Bureau of Economic Analysis. “Gross Domestic Product, 2nd quarter 2018 (third estimate).” 27 Sep 2018. U.S. Bureau of Economic Analysis. “Table 1.1.1. Percent Change From Preceding Period in Real Gross Domestic Product.” Interactive data extracted 11 Oct 2018. U.S. Census Bureau. “Income, Poverty and Health Insurance Coverage in the United States: 2017.” 12 Sep 2018. McLaughlin, Patrick A., and Oliver Sherouse. RegData US 3.0 Daily (dataset). QuantGov, Mercatus Center at George Mason University, Arlington, VA. Daily Summary tracking of restrictions in the eCFR (Electronic Code of Federal Regulations). Downloaded 11 Oct 2018. McLaughlin, Patrick A. and Oliver Sherouse. 2017. “QuantGov—A Policy Analytics Platform.” “RegData 3.0 Restrictions by Year.” Downloaded 11 Oct 2018. Grawert, Ames and Adureh Onyekwere, Cameron Kimble. “Crime and Murder in 2018: A Preliminary Analysis.” Brennan Center for Justice at New York University School of Law. 20 Sep 2018. Bureau of Labor Statistics. “Labor Force Statistics from the Current Population Survey; All employees, thousands, coal mining, seasonally adjusted.” Data extracted. 11 Oct 2018. U.S. Energy Information Administration. Short Term Energy Outlook. 10 Oct 2018. U.S. Border Patrol. “U.S. Border Patrol Apprehensions FY2018 YTD (October 1 – June 30)” Undated. Accessed 11 Oct 2018. U.S. Border Patrol. “Total Illegal Alien Apprehensions By Month Fiscal Years 2000-2017.” Undated. Accessed 111 Oct 2018. U.S. Bureau of Economic Analysis, Corporate Profits After Tax (without IVA and CCAdj) [CP], retrieved from FRED, Federal Reserve Bank of St. Louis. 11 Oct 2018. Yahoo! Finance. “Dow Jones Industrial Average.” Accessed 11 Oct 2018. Yahoo! Finance. “S&P 500.” Accessed 11 Oct 2018. Yahoo! Finance. “NASDAQ Composite.” Accessed 11 Oct 2018. Fima, Ari. “Longest Bull Market in History? Our Newsroom Debates.” The Street. 23 Aug 2018. Bureau of Labor Statistics. “Consumer Price Index – All Urban Consumers.” Data extracted 11 Oct 2018. Bureau of Labor Statistics. “Employment, Hours, and Earnings from the Current Employment Statistics survey (National); Average Weekly Earnings of All Employees, 1982-1984 Dollars.” Data extracted 11 Oct 2018. Bureau of Labor Statistics. “Employment, Hours, and Earnings from the Current Employment Statistics survey (National); Average Weekly Earnings of production and nonsupervisory employees, 1982-1984 Dollars.” Data extracted 11 Oct 2018. University of Michigan Surveys of Consumers. “The Index of Consumer Sentiment.” Sep 2018. National Association of Realtors. 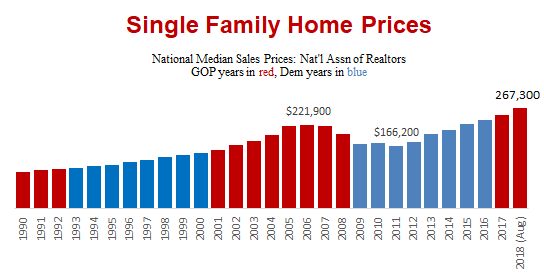 “Sales Price of Existing Single-Family Homes.” 20 Sep 2018. U.S. Census Bureau. “Time Series: Not Seasonally Adjusted Home Ownership Rate.” Data extracted 11 Oct 2018. U.S. Bureau of Economic Affairs. “U.S. International Trade in Goods and Services, August 2018.” 5 Oct 2018. U.S. Bureau of Economic Affairs. “Table 1, U.S. Trade in Goods and Services, 1992-present.” 5 Oct 2018. U.S. Bureau of Economic Affairs. ”Table 3. U.S. International Trade by Selected Countries and Areas: Balance on Goods and Services.” 5 Sep 2018. Estimates From the National Health Interview Survey, January–March 2018.” 29 Aug 2018. U.S. Department of Agriculture, Food and Nutrition Service. “Supplemental Nutrition Assistance Program (Data as of Oct 5, 2018).” Data extracted 11 Oct 2018. Administrative Office of the U.S. Courts. “Confirmation Listing; Judicial Confirmations; 115th Congress.” web page accessed 11 Oct 2018. Administrative Office of the U.S. Courts. “Judicial Confirmations for February 2010.” archived web listing of confirmations in 110th Congress. accessed 11 Oct 2018. U.S. Treasury. “The Debt to the Penny and Who Holds It.” Data extracted 11 Oct 2018. U.S. Congress, Congressional Budget Office. “Monthly Budget Review for September 2018.” 5 Oct 2018. U.S. Congress, Congressional Budget Office. “An Analysis of the President’s 2019 Budget.” 24 May 2018. U.S. Congress, Congressional Budget Office. “The 2018 Long-Term Budget Outlook.” 26 Jun 2018. U.S. Energy Information Administration. “U.S. Field Production of Crude Oil.” Data accessed 11 Oct 2018. U.S. Energy Information Administration. “Weekly Cushing OK WTI Spot Price FOB.” Weekly oil price data. accessed 11 Oct 2018. U.S. Energy Information Administration. “Table 3.3a Petroleum Trade: Overview.” Monthly Energy Review. 25 Sep 2018, Accessed 11 Oct 2018. Wike, Richard and Bruce Stokes, Jacob Poushter, Laura Silver, Janell Fetterolf and Kat Devlin. “Trump’s International Ratings Remain Low, Especially Among Key Allies” Page 18. Pew Research Center. 1 Oct 2018. Pew Research Center, Global Indicators Database. “Opinion of the United States: Do you have a favorable or unfavorable view of the U.S.?” Data accessed 11 Oct 2018.